A hidden time bomb ticks away inside the government budget: Within a handful of years, US taxpayers will be on the hook for over $100 billion in student loan defaults. Just last Friday, the US Department of Education released new data on student loan defaults. In short: The hissing sounds coming from the student loan bubble are getting louder. I doubt it’s a coincidence the Department of Education chose last Friday (when attentions had shifted to the weekend) to release new three-year cohort default rate data for federal student loans. The three-year cohort default rate is defined as follows: the percentage of borrowers who enter repayment on certain loans during a particular federal fiscal year (Oct. 1-Sept. 30) and default or meet other specified conditions prior to the end of the second following fiscal year. The default rate is horrendous, and it’s only going to get worse. These are uncollateralized loans, so losses given default will be orders of magnitude higher than losses on subprime mortgages; in subprime, losses were mitigated by the value of housing collateral. “The default rate, for the first three years that students are required to make payments, was 13.4%, with for-profit colleges reporting the worst results, the US Education Department said today. This 13.4% figure will surely go higher. The post-2008 surge in student loan volume won’t season and start defaulting until after the Class of 2013 graduates. Then we will see the real fireworks. This crisis will finally capture the public’s attention. What are the investing implications of these defaults-in-waiting? An obvious conclusion is to avoid owning the for-profit education stocks, no matter how cheap they may appear. 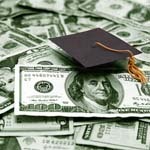 Education stocks including Apollo Group (APOL) and ITT Educational Services (ESI) probably face a surge in legal and regulatory risk once the enormous scale of student loan defaults comes to public attention next year. In fact, even after they’ve suffered large declines, the for-profit education stocks are starting to look like attractive short sales.